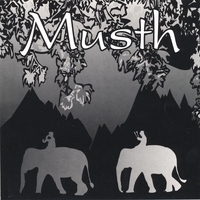 A 1994 experimental studio project by the group Musth (Jon Bernson and Greg Grant), who teamed up with technical mad scientist Tony Brooke. The album was recorded at The Music Annex in Menlo Park and at Virtual Studios in San Francisco. Mixed at Virtual Studios and Z-Technic. Mastered at Silent Way. The project used the new Tascam DA-88 format, which had a 1 hour and 50 minute tape length, enabling extended improvisations and Greg's circular breathing method. "Across The Courtyard" was recorded to 2-inch 24-track analog tape. "This is an adventurous, experimental album. It is very image provoking and would make great film music. Musth is Jon Bernson playing drums and percussion and Greg Grant playing nylon string guitar and alto saxophone. The spirit of this recording was total spontaneity and freedom. Greg and Jon improvised freely in the studio without any preconceived ideas. After a bulk of material was recorded, they picked out the magical moments that they liked. Some were good enough "as is". Others warranted overdubbing, also improvised, and ended up as multi-layered sonic excursions. This is the kind of music you want to put on in a darkened room or for when you're driving at night. It goes deep and will take you into your subconscious... Some of the places it takes you are marvelous, indeed. This music is pure; it comes straight from its source, passing through Jon & Greg, but it's way beyond them. This is truly channeled music in the sense that neither Jon nor Greg consciously played it, but allowed it to flow out of them. The blurb on the CD says: In the languages of northern India, Musth (from a word of Persian origin) translates as 'a state of intoxication.' It is used to describe altered behavior in either humans or elephants. Various Sanskrit words used to describe this state come from the word mada, which can mean 'hilarity', 'rapture', 'excitement', 'sexual enjoyment', 'lust', or 'inspiration'. " Listen to full tracks below, "Colors," "Nightfall For India," "Meet Me At The Sunrise" and "Funeral (low-fi for web)." Follow the link below to hear more clips and buy the album.